Second time I made this great pasta dish. Looks (again) awful but tastes great. 1. Mushrooms fried with some salt added. 2. Onions, garlic chopped and lightly fried, tomatos added and boiled for 10 minutes. Some salt, sugar and thyme added. Then again tomato sauce, eggpland, mushrooms and second layer of plates. 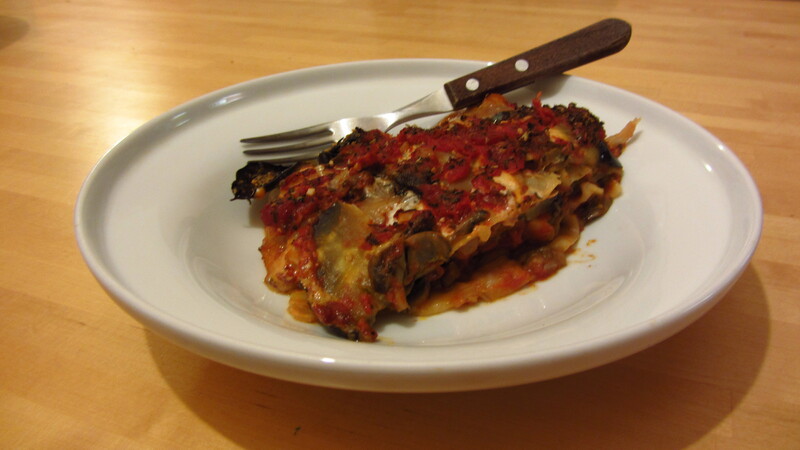 …covered everything with one more layer of filling (tomatos, eggplant, mushrooms)…so that no naked lasagna plates can be seen. Covered form with folio and kept it in extremely warm room for 45 minutes (170 deg). Previous Post Wrap with mungoa sprouts. Fastfood. Again! Next Post Banana pancakes – sunday morning is once a week so use it wisely!